Several important events have been carried out over the last month, and we are going to overview them one more time. - FoodCoin collaboration with Ed Begley Jr. is going further, and our teams are working actively side-by-side filming new episodes. At the beginning of May, FoodCoin CEO Gregory Arzumanian gave an interview for the episode. - Program producers also met Mark Meytin, co-founder of 1000ecofarms.com, and Liz Reitzig, owner of the Grassfed of the Hill Food Buying Club. The filming took place at Clark's Farm - a 500-acre sustainable farm in Maryland that grows grass-fed beef, pastured pork, organic produce and herbs. - After Mark and Liz, Innovations TV Team also interviewed our partner and Advisory Board member, Thomas Hal Robson Kanu. The broadcasting of the episode is planned on Q3 of 2018. Stay tuned! - Finally, a brief interview was recorded between FoodCoin co-founder Sergey Grigoryan, and the CEO Gregory Arzumanian. They highlighted most important questions, which concern FoodCoin community. Besides collaborating with media producers, FoodCoin Team will not forget about the events. 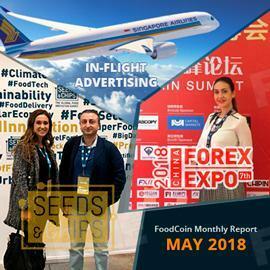 - At May 7, FoodCoin Team participated in The Global Food Innovation Summit, also known as SeedsΧps, which took place in Milano, Italy. The main subject of this Summit are the innovations in food technology. Innovative companies of the world were represented there. The CEO of FoodCoin Ecosystem, Gregory Arzumanian, held preliminary negotiations on cooperation with several European companies, mostly with Italian and Scandinavian. - Besides Europe, FoodCoin is also expanding around Asia. Our new team members, Veronica Tasciotti and Giulia Bottaro, took part in 7th China Forex Expo of 2018, which took place in Great China International Exchange Square of Shenzhen. They did a huge work on this 2-day event, met many interesting people and found very promising contacts. FoodCoin has a huge potential to become real in Asian market, and we expect some tasty news from there. Veronica Tasciotti and Giulia Bottaro are two new FoodCoin team members come from Italy. They have great experience and excellent skills in participating in international events and establishing useful contacts and partnerships. Pavel Pavlovsky is a new member of Tech Team. Pavel is Java Developer for about 12 years. He develops backend functionality for FoodScan and FoodCoin Blockchain projects. Alexey Knyazev is engaged in the development of the payment system and the FoodCoin Exchange in advance. Because of this new law on personal data protection in Europe, Tech Team had to rework completely the account verification system, which was almost ready. -Updating the FoodCoin Blockchain system to comply with the GDPR law on personal data (Verifiers). FoodCoin Ecosystem has reached an agreement to advertise FoodCoin in the flights of Singapore Airlines this September. About 1.6 million passengers who will fly both domestic flights, and to Japan, China, Australia, Europe, the US, as well as in other directions, will know about Foodcoin. If you have planned a flight for this time to or from Singapore, be sure to take beautiful photos and send us! All your thoughts and ideas are welcome as well! Thank you for being with us, we are proud of our amazing community! Follow our news and announcements in our social networks. The next monthly report comes out in June.